The Fw 190 A-5 is a Rank III German fighter with a battle rating of 5.3 (AB), 4.7 (RB), and 4.3 (SB). It was introduced in Update 1.35. '"Würger" is the German nickname of this beast of a plane. It can be translated as slayer, choker, or strangler. In that regard fits the English designation well too: "Butcher-bird"
One nineties are fighters, and while this one can load additional payload, it will reduce the planes combat ability. Using it as a fighter-bomber is generally not advised, this would be the duty of the 190F-8 instead. Rocking four 20 mm cannons, an armoured radial engine, armoured fuel tanks, and sometimes two artillery rockets, this aircraft is far from shy in the giving and taking role. Anything at 12 o'clock is soon to be dead. The wing root mounted cannons should be additionally placed on a separate key for head-on attacks. The outer-wing guns would only miss on distances of 800-1000 m (~0.7 miles). This also helps for tricky shots, as the second pair of 20 mm guns only has 90 shots each, instead of the whopping 250 of the inner ones. The rockets are an interesting piece of equipment. Developed from the 210 Nebelwerfer artillery system, they were originally used to break up B-17E formations by forcing the US pilots to evade them. This was rather done to safely get closer to now separate lone bombers then actually use the rockets to kill them. The BR.21 has the same shell drop as the MK 108 cannon, so if you are already used to it from flying the 109, well done. If not, which wouldn't be a surprise as this is the page for the Fw 190, then prepare for some misses. Like the "Sledgehammer" Mk 108, the accuracy is woeful, not made better by the low velocity. This is a characteristic noticeable in game which makes them difficult to use in direct fighter to fighter engagements. But all of these deficits are made up by the warhead. Oh boy... they've got power. With the fuse timer set correctly, even misses will damage enemy planes, as the shock wave radius gets close to 100 m. So watch out when using them against ground units. You will most likely just kill yourself, over 100 m safety distance is strongly advised!!! 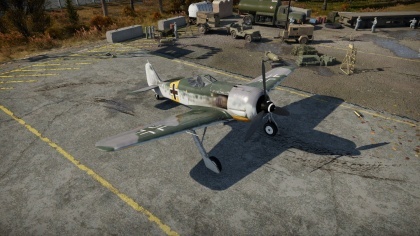 The Fw 190 A-5/U2, as all the planes in this line, is one of the best Boom and Zoomers in the game and should be flown exclusively in this style. The performance at high speeds is excellent, as is their dive and zoom characteristics. 'Do not ever engage in a turn fight as this will most likely end badly. Instead, fight only in the vertical. Try to have an altitude, or speed advantage over your opponents (by climbing to the side at the start of the battle and then enter the highest battle you see). But you can still win fights when you are lower in energy than your foe. 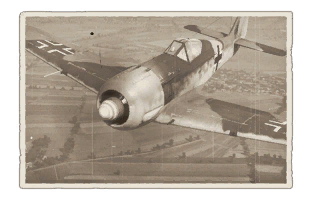 In the defensive, you can often just dive away from planes, such as Spitfires and La-5s, but you need at a decent altitude to gain your top speed, so do not be too quick to dive after an enemy, if they fly below your plane, unless you are higher then everybody else or alone. Just be sure to have the time to regain the lost altitude. In a dive the 190 can, due its short wings, pull quite some stunts to either lose the hunter, or even make him loose his own wings! This is a favourable strategy against La-5s, Yaks & Spitfires who have, due their low wing loading (and partly wooden wings for the Russians), less resistance against high G maneuvers. Again, be sure to regain your energy by a zoom-climb. Just look out while doing so, many pilots die as they do not notice a second enemy aircraft approaching. German proverb:"Wenn Zwei sich streiten, freut sich der Dritte." ~ "When two quarrel, the third will reap the success." Of course this could also be you.